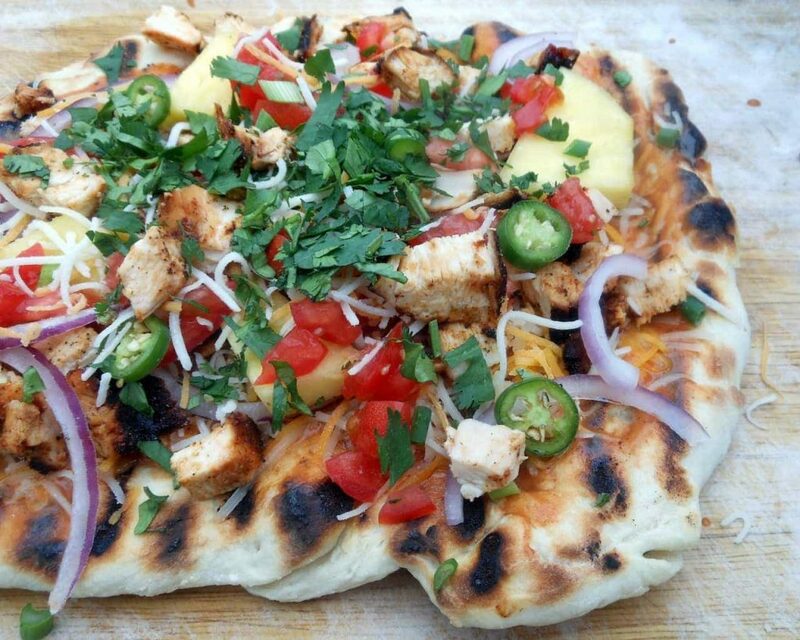 The Best Grilled BBQ Chicken on a delicious grilled pizza crust with fresh tomatoes, red onions, pineapple, peppers, and cilantro. 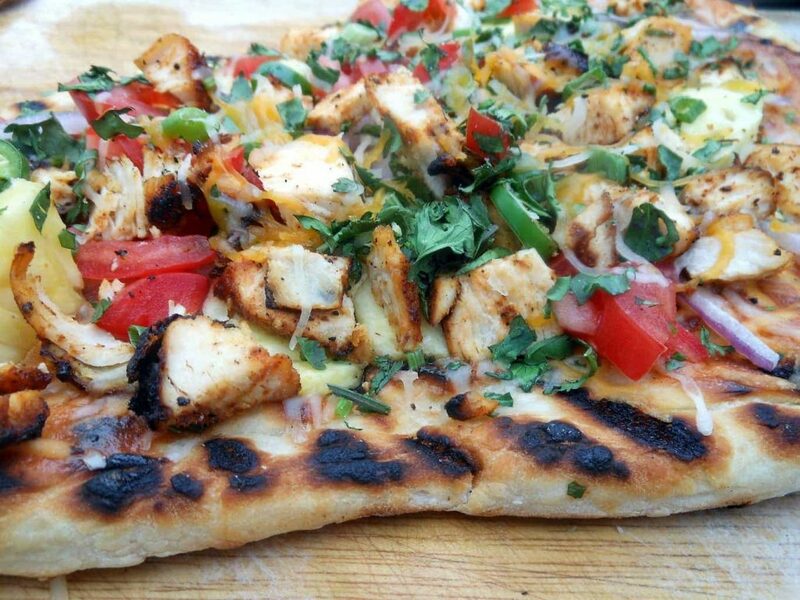 This Grilled BBQ Chicken Pizza is one of my most favorite summer meals! Evan has been doing this thing lately where he looks up songs he likes on YouTube– you know how some people will post the karaoke version of music with the lyrics in print? Anyway, he looks up songs that he likes and then sits in front of the computer, very focused, and sings. Loudly. He does NOT like his sing-a-longs to be interrupted. So if Andrew asks him a question, he will raise his index finger like, “Hang on a minute there, Guy,” and then he will continue singing. Andrew is not that patient about these kinds of things (something he comes by very honestly) and so he will usually attempt to get Evan to pause or interrupt. Because then Evan will shriek, “ANDREW!!!!! I’m DOING SOMETHING!!! !” It is a sing-a-long war. The other day Andrew decided to try singing with Evan. Bad move, dude. Andrew is bigger so his voice is bigger. Also he’s in chorus (—interlude— he had a chorus concert last night that was straight up AMAZING. I was so so so impressed with those kids; I had no idea!!) so he knows how to make his voice carry. All of this seriously messed up Evan’s program. I thought he was going to fall apart. So I shoved this pizza in his face. All better. Today you get two recipes for the price of one!! Nevermind. These recipes are all free anyway. BUT! I’m sharing two. You have to start with my favorite BBQ chicken in the universe. And if you’re gonna make this chicken and then make the pizza (P.S. This is the BEST PIZZA I HAVE EVER MADE IN MY WHOLE LIFE) then go ahead and make all 4 breasts of chicken because I have another recipe using it coming up tomorrow. And if you don’t feel like making the pizza then just make the chicken and invite people over. They will think you are some kind of BBQ pro. In a small bowl, combine the brown sugar, paprika, chili powder, cumin, onion powder, garlic powder, and cayenne pepper. 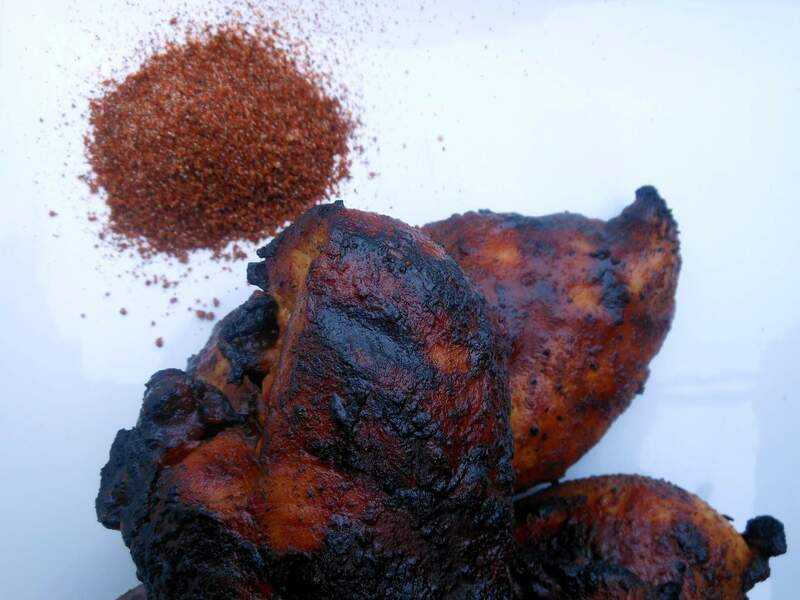 Rub the seasoning all over the chicken (start with only half and add more rub as needed- that way you can save the rest and it won't be contaminated by raw chicken) breasts, place them in a dish, cover, and refrigerate until you're ready to cook. To cook the chicken, heat an outdoor grill to about 450. Make sure the surface is scrubbed clean. You can oil the cooking grates if you want but I've found if you start with a HOT HOT surface it #1) won't stick and #2) will seal in the juices so you have tender juicy grilled chicken. When the grill is hot, lift the lid and place the chicken on the grates. Close the lid and cook for about 2-3 minutes. Flip the chicken, close the lid, and cook on the second side for 2-3 more minutes. Reduce the grill heat (if you're cooking with gas; if you're using charcoal just move the breasts away from the most direct heat) Flip the chicken again (if you turn it you can create that professional-looking criss-cross pattern on the outside). Cook for 5-7 minutes. 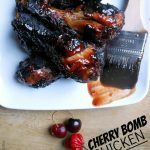 After about 3 minutes, brush on the BBQ sauce and close the lid again. Flip, and cook for approximately 5 more minutes, brushing on the BBQ sauce after about 2 minutes. COOK TIMES ARE NOT EXACT. Always make sure that your chicken has an internal temperature of 165. If you do not have a meat thermometer then cut the chicken open at the thickest spot and make sure the juices run clear. My chicken breasts are usually on the thicker side so cook times are a little longer. When the chicken is done, remove it to a plate and let it rest for a few minutes before slicing. I was afraid to grill pizza. I saw these fancy pants pizza grill pans on sale at Target and I almost bought one. But I managed to walk away (what?!? I know. That never happens at Target). Anyway, I’m glad I did because I decided to get brave and just put the pizza RIGHT ON THE GRILL. At first I had nightmares about how on earth I was going to get a bunch of gunky pizza dough off the grill. But look! It worked! No sticking or anything. Also this pizza dough is a small miracle all by itself. I always make my own pizza dough and my typical recipe takes 2 hours to rise. That does not work most days. You can try my favorite 10 Minute Pizza Dough recipe, but know that the results will be less fluffy pillowy pizza dough and more thin and crispy. You can also try this Copycat Mellow Mushroom Pizza Dough – it’s my actual all-time favorite. You just need a little time to work it out. The pizza dough shown here, and also included in the recipe below is ready in 5 minutes. I’m not even kidding. I found it at The Kitchn; you can see the original Homemade Thin Crust Pizza Recipe here. Sorry. I was trying to help. 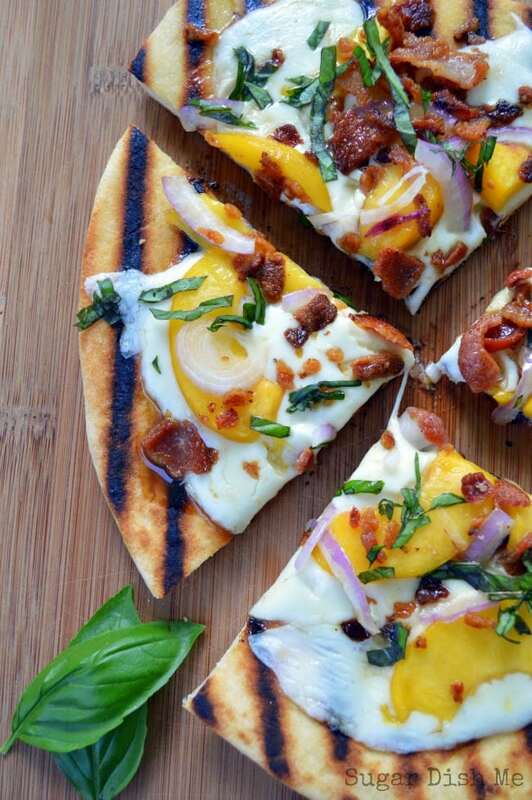 Please make this pizza!! It’s the best excuse ever to loiter around outside with a glass of wine. Pour the warm water into a large bowl. Stir in the active dry yeast and let it sit for a minute until it has dissolved. Add the flour and kosher salt. Stir until a shaggy dough forms. Scatter a little extra flour on the counter, turn out the dough (including the little loose scraps) and gently knead for 5 minutes. The dough will be slightly tacky-- toss more flour on the counter while kneading as needed.Throw the dough back in the bowl (don't worry about cleaning it), dump the olive oil over the dough, and cover the bowl with a towel. Heat the grill. I mean HEAT it. I let mine get up to 500 degrees before cooking. 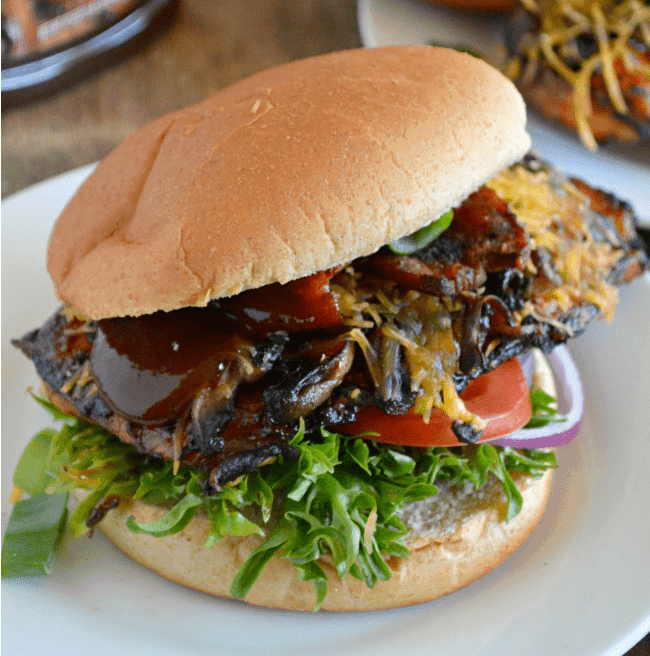 While the grill heats, whisk together the BBQ sauce and ranch dressing. 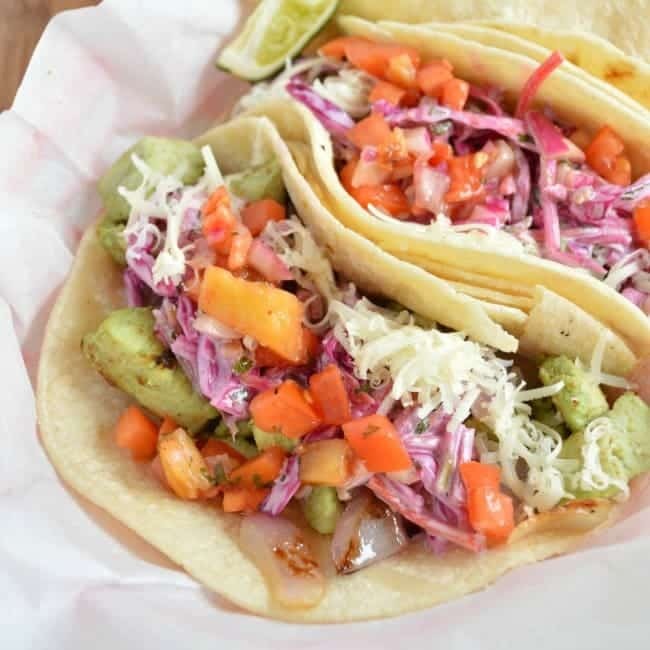 Gather up your ingredients-- the sauce you just mixed and ALL the toppings. Head outside. Sort of slosh the dough around in the olive oil and then divide it in half. Stretch one half into a circular shape. Shape really isn't important-- one of my pizzas was like a triangle. Thickness IS important! You should end up with about a 10" pizza-- if you let the middle get too thin it will burn. 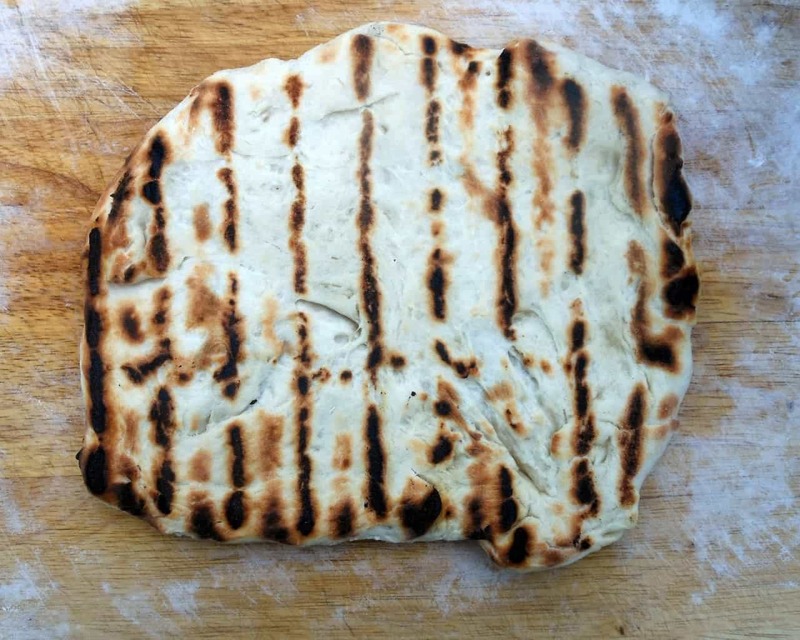 Toss the dough onto the hot grill. Close the lid. Cook for 2-3 minutes. Remove the dough to your work surface UNCOOKED SIDE DOWN. On the cooked side spread out half the BBQ sauce mixture. 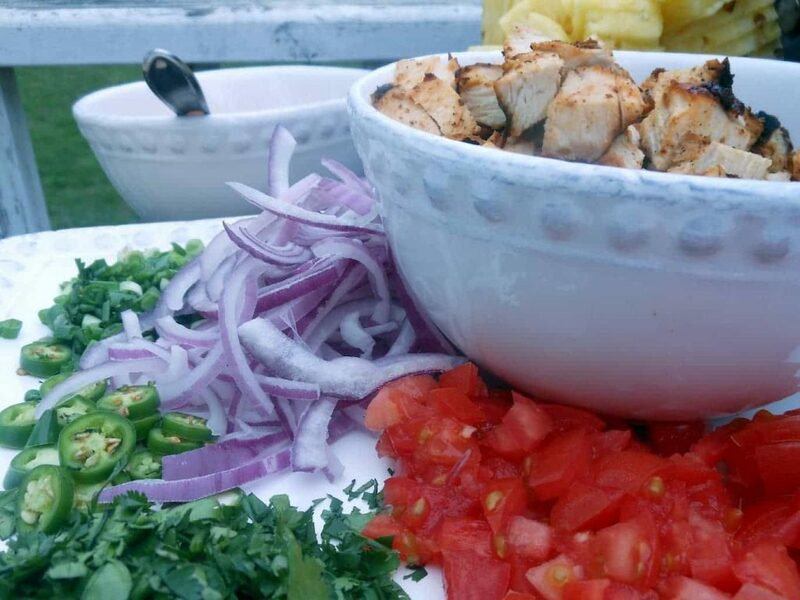 Top with ½ cup of the cheese, half the chicken, half the red onions, half the Roma tomatoes, half the fresh pineapple, and half the Serrano peppers. Put the pizza back on the grill and cook for another 3 or 4 minutes. Remove to a cutting board and let it rest for a minute before cutting. Repeat the process with the second pizza. Before you start, having a workspace set up outside will be helpful. Once you start grilling the pizza everything will go very quickly so starting out with some organization will be very beneficial! I like to have a cutting board outside with me to remove the pizza to for topping and then cutting. Thanks for linking to my pizza dough recipe! Your pizza is so colorful, vibrant, pretty..it’s like the rainbow on a crust! Seriously love it!! Your one-hour whole wheat pizza dough is definitely my go-to pizza dough recipe. It’s really really easy dough to work with. I seriously wish I could eat this right now. 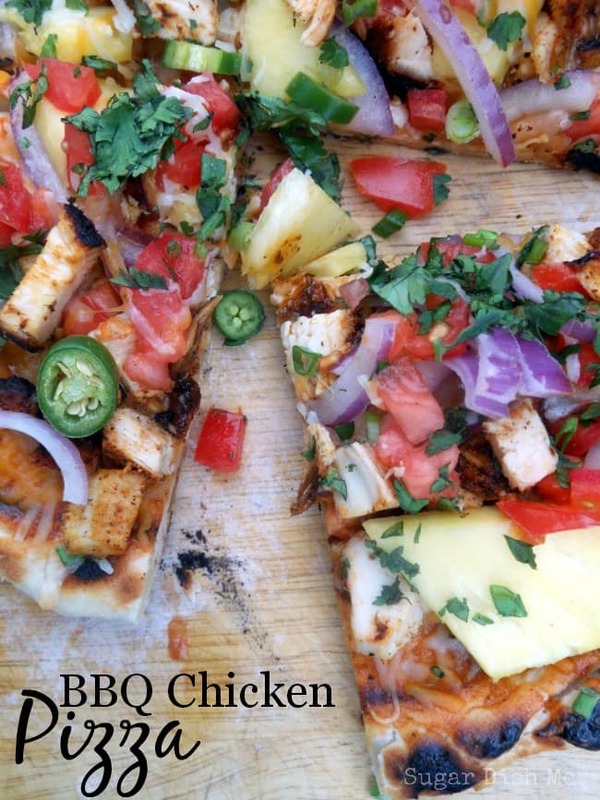 BBQ chicken pizza is really one of my favorite things….this looks so, so good! You can totally do this at home. It’s REALLY simple! We love bbq chicken pizza!!! We are obssessed with Sweet Baby Rays bbq sauce.. You seriously need to try it.. I do buy Sweet Baby Rays Sweet & Spicy sauce sometimes (Chad loooves it), and it IS delicious. But the first ingredient is high fructose corn syrup so I try to work around it when I can. But if I’m just grabbing sauce at the grocery store quick, I grab that one every time!!! And damn, that topping would be so popular! Your pizza looks so delicious! I WANT THIS PIZZA! I want to make it while Evan and Andrew sing me songs from YouTube. One small problem, I don’t seem to have “active dry yeast” on hand. I usually take care of that pretty quickly with Monistat. I also don’t know how to form it into “Shaggy Dough” but I assume it’s similar to “Shaggy Dog,” of which I have three. Shaggy dogs are the best!! I have one. My mom has 4. My sister has 2. My brother has 1. And when we all get together there are almost as many dogs as people. We don’t share pizza with them, though. They might be a little mad about it. 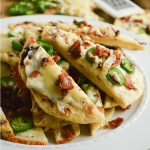 I love this recipe and mostly I love that you tried grilling pizza–it makes me soooooo nervous to think about it! Will I try it? Maybe. I’m a scaredy pants. Then again, I need a new grill anyway, so what could it hurt? Definitely I will try the chicken and the wrap that you posted today. Yum! First – when I get back to my mum’s big garden and we have a BBQ this summer, this chicken is going on it! Second – this made me smile a lot, partly because it reminds me of sibling squabbles with my little sis’, but also because I remember (in those days without internet!) getting lyrics in magazines to cut out and sitting with those in hand trying to sing along (badly, and totally out of tune!) to whatever songs I was listening to at the time! Did you tape things off the radio and then play it a bajillion times to learn the lyrics? haha, we used to listen to the top 40 every week and many a sunday I would sit with tape in machine, finger poised above record just waiting for a certain song!! Thanks for the tips, Heather! I know pizza, but I do not know grilling and it’s one of my summer self-improvement projects. I especially like the tip about having an outdoor work space set up. The one time I tried to grill a pizza I brought the little grill up near the kitchen door, and was running back and forth trying to top in between sides, and it was kind of a pain. 2 questions (which are probably obvious to grillers, but like I said, I am not a griller. Yet. How do you know what temp your grill gets? If it tells you, that’s cool. Mine doesn’t, and I’m clueless about the various features of grills. What do you use to get the dough on and off the grate? I usually get my pizza from counter to stone via a piece of parchment and a pizza peel, so I’m trying to mentally make the shift without the parchment catching on fire or me cursing while my beautifully stretched dough crumples into a heap. You CAN do this! I just learned through trial and error and it doesn’t take long to get a rhythm down. First– don’t try to make a giant pizza. It will be disastrous. Start small and work your way up as you get more comfortable. The dough recipe here makes two 10″ pizzas, smaller if you leave it a little thicker. I think it’s a great place to start. If you have a pizza peel, USE IT! Lots of flour and cornmeal underneath will help. Also helpful here is that you throw the dough onto the hot grill first without toppings. When I use my pizza stone in the oven the toppings are always the first things to go awry when the dough sticks. I use a GIANT spatula to remove my pizza. If you wanna try it with a pizza peel that would work, too. But I’d use a spatula first to lift the pizza off the grates (because if you have thin parts it might stick a little). Get your grill AS HOT AS YOU CAN! My grill does tell me the temp, but in the instance of something like a small charcoal grill, just let the coals get RED RED HOT and then turn slightly gray with the lid AND the grate on before you add the dough. The hotter the better. If you have a gas grill with no temp gauge then just follow the same instructions. Turn the burners ALL THE WAY up, close the lid, and just let it get crazy hot for 5-10 minutes. Then add the dough. Hope this helps! And definitely share photos via Facebook or Instagram once you try it! Oh my goodness! Yes this is one of my favorite foods and yes I love it on the grill. Great recipe! Hi, Shawna! Thanks so much! 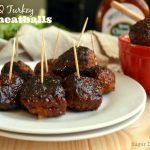 Lots of good food at your little BBQ party– thanks for inviting me to participate again! That is GORGEOUS and looks SO tasty – yumm!! Hi, Rebekah! Thanks so much!! This is a delicious roundup of pizzas . I can’t wait to try them. 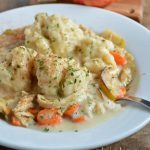 Thank you so much for sharing this on Foodie Friends Friday. Thanks so much for including me Joanne!!! Hey Debi! I used prepared dressing. You could totally try it with the dry ranch seasoning but I’d use WAY less than 2 tablespoons. You could also omit the ranch altogether and just use BBQ sauce. This is hands down one of my favorite pizza recipes ever. Hope you enjoy!